I ended up loving the quiche with broccoli most of all. So we'd often make a quiche and fill the left half of it with broccoli (for the girls) and the right half of it with bacon (for the guys). 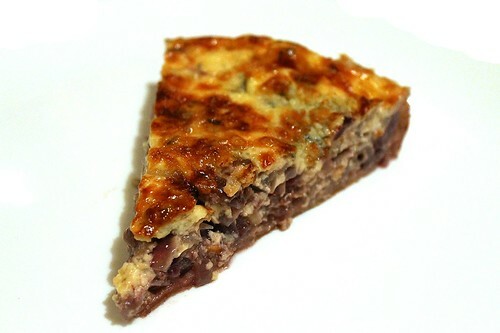 Once I tried onion and cheese quiche in Coffee bean and it became another favorite. This time I made a quiche with red onion and blue cheese, thanks to Google for the idea. The red onion cooked till it's soft and sweet made a great combination with savory and fresh Bleu d'Auvergne cheese. I used to make the shell of short pastry as it's suggested by most of the recipes. However I always felt like the pastry was a bit too heavy for me and there was too much of it, especially on the sides. Once I came to Fontainebleau I tried a quiche baked in puff pastry shell and liked it much more. Thus this time I made the puff pastry shell with no border and got a lighter feeling quiche. It's now quite far from the classics, but I feel like continuing to bake this way. Peel the onions and slice them 5 mm thick. Heat 2-3 tbs olive oil in a medium pan. Add the onions and cook on medium low heat for 10-15 minutes stirring from time to time. The onions shouldn't brown but should soften and get translucent. Whisk the eggs slightly. Add the cream, thyme and season with salt and pepper. Whisk again to get things combined. Unfreeze the pastry (if frozen) and roll it to get the shape of the bottom of your baking dish. I'm using a round one (about 24 cm in diameter). Slightly oil the bottom and sides of the dish and cover with the pastry. Fork the pastry to make sure it rises evenly. Bake at 200C for 10 minutes. Take out and press the pastry down to the bottom and the sides. Let cool for 5-10 minutes. Spread the onions on top of the pastry. Crumble the cheese with your hands to cover the onions. Pour in the egg and cream mixture, spreading it evenly across the quiche. Return the quiche to the oven and bake for another 20-25 minutes. Ready quiche will turn golden brown on top and will rise quite substantially. Take it out of the oven and let cool for 15-20 minutes. It will slightly breath out and get a bit firmer and easier to cut. I prefer the quiche warm (to me it is especially good when just baked. So I'd cut and serve it right at that point. Than it does a perfect job as a main dish for lunch / dinner. Many people like it cold though, so you can let it cool completely cut and serve as an appetizer or breakfast. I love quiches and this one sounds delicious. The combination of red onion and bleu d'Auvergne is surely a wonderful one!